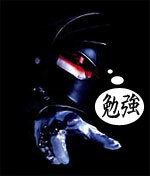 An "alter ego" of Demon Kogure, who was once the frontman of Seikima II. This is his non-heavy metal side project. Demon Kogure has made so many Japanese TV show and commercial appearances, that it's amazing. He even appeared on the Larry King show in 1994. Despite the fact that he is a heavy metal singer, he's quite well known. Not only does Demon Kogure claim to have been born in a pre-BC time period, but he also claims to have taken over the world on 12/31/1999.